Lunch-hour workouts -- are those even a thing? Getting to the gym, changing clothes, trying to squeeze in a workout, only to get sweaty and need a shower so you can rush back to work; how are you supposed to do all of that in an hour (or less)? I'm here to tell you it is, in fact, possible... just maybe not as described above. Rather than taking time to hit the gym, change, and shower afterward, you can finish an effective routine in just 30 minutes, all while wearing your normal work clothes. The workout is very straightforward: a five-minute warm-up, a five-minute cool down, and four five-minute interval series. Rest is built into the program, but if you need more rest, choose three of the five-minute series and add a few minutes of extra rest between each series for a slightly easier workout. Start your Half-Hour of Power with a relatively easy warm-up. Hit the stairs and start climbing! You'll keep at it -- up and down -- for five minutes. 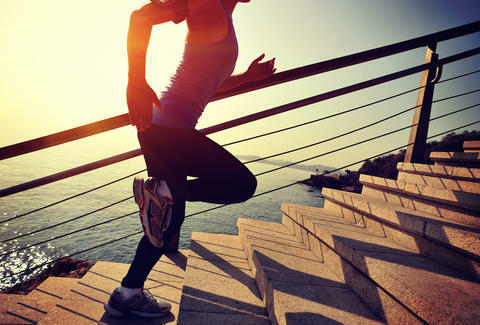 Start at a moderate pace and every minute increase your intensity. By the end of the five minutes you should be hoofin' it up and down the stairs going as fast as you can. If your warm-up didn’t already do the trick, the first HIIT series is guaranteed to get your heart rate up with simple cardio moves. The trick here is to work at all-out effort during each high-intensity interval. A Tabata consists of eight 20-second high-intensity intervals, each followed by 10 seconds of rest. A total Tabata only lasts four minutes, so keep up your pace to get the most from your effort. Try using a Tabata timer app to keep you on track. This Tabata only consists of two exercises: lateral slides and mountain climbers. You'll alternate between each exercise every other interval so that intervals one, three, five, and seven are lateral slides, and intervals two, four, six, and eight are mountain climbers. Lateral slides: Keep your body low, and slide back and forth across a 6 to 10ft space as fast as you can. Make the action harder by touching the ground each time you change directions. Mountain climbers: You can opt to step your legs back and forth from a high push-up position, or you can jump them back and forth, alternating which leg is in front. If you're wearing a skirt, instead of placing your hands on the ground, place them on a bench or table instead. For obvious reasons. After your Tabata, rest one minute, then continue. Get ready for your lower body to burn. This first interval series only lasts five minutes, but the goal is to burn out your legs with a serious focus on squats and lunges. Focus on your form! Whenever you perform squats or lunges, you want to keep your chest upright and forward-facing, and your knees aligned with, but behind your toes. This five-minute high-intensity interval series is focused on combining cardio and upper-body work. Believe it or not, the upper-body exercises are actually your rest periods. With just five minutes of intense work left in your Half-Hour of Power, get ready to kill your core. You’ll spend intense intervals of 30 seconds work followed by static or lower-intensity intervals of 60 seconds. Spend your last five minutes simply walking or marching in place to bring your heart rate back down. There’s nothing magic here -- you can add a few stretches if you feel tight and drink water to rehydrate. It’s OK if you spend this time secretly imagining ways to kill me. I get it. Laura Williams is an exercise physiologist and fitness writer who regularly puts herself through this same type of HIIT torture. Yell at her on Twitter: @girlsgonesporty.